Artomatic is an art show like no other! This exhibit is not juried and not curated, which means that anyone can basically enter, (if you pay your money), and it will all be mashed up together. One room could showcase urban Gothic sculpture and flower photography side by side. Another juxtaposition can be of impressionist landscapes and cartoony graphic novel stills. The joy is in the seeking, finding and appreciating these nuances. Come out for all the free art you can handle- 11 floors of arts experience, including stages full of dancing and music, workshops, wine and beer tasting, Busboys and Poets pop up cafe, comedy gigs and all kinds of other interactive features. Plus, about 1,300 artists show their work! 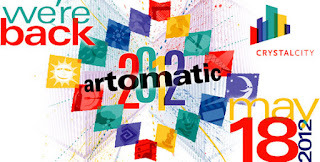 I am participating in Artomatic for the very first time. As my 'normal' work is not the type to be displayed in a more formal artistic setting, this was a challenge for me. My show "Purse-spirations: Purses Inspired by Other Art" is the prefect thing for this type of show. It is a little wacky, a little cool, a lot of different, in order to stand out in the crowd of other such art. If you did not have the chance to come to the Workhouse Arts Center to see the show in March, this is your second chance! I am located on Floor 9, Suite 900, Space 102. It is a dark purple wall, near the dance stage. If you aren't sure when to come, I'll be at Meet the Artist Night on Saturday, June 2, 7-9pm. There is also an Art-To-Go Marketplace every Saturday from 1pm to 6pm. I will be vending there June 16. Be sure to check out the Plan Your Visit page on the Artomatic website! It has great information about what to expect, what to bring, what you will find. Take Metro, parking is tight in Crystal City. It is on the yellow and blue lines. Artomatic is less than a block from Crystal City Metro station. Cross the street and walk one-half block south on Bell Street. Artomatic is on your left, through the big courtyard. The last train towards DC leaves at 11:49 PM on Sunday through Thursday, and 2:49 AM on Friday and Saturday nights (that is, Saturday and Sunday mornings).